The nature of power, as played out through a sexual and economic game of class, property and inheritance, is the somewhat obscured subject of Peter Greenaway's masterfully baffling, frequently hilarious 1982 film The Draughtsman's Contract. This is a film in which surface appearances are very much set off against the reality underneath, a reality that can never quite be seen directly, head on, but only glimpsed out of the corner of one's eye: truth, like the living statue that mysteriously moves around the grounds of a rural mansion, rude and naked but mostly unseen by the mannered aristocrats who inhabit this estate circa 1600s England, is so elusive that one is never quite sure if one has actually glimpsed the truth or merely a figment of the imagination. Right from the beginning, Greenaway is hinting at the disconnect between presentation and truth, as during the credits he cuts away to a high society party at which the bewigged, heavily made up guests tell charmingly scatalogical and urinary anecdotes that seem to be very much at odds with their elaborately sophisticated appearances and the bemused titters with which they relate these stories of bodily function. Rarely again in the film do they ever seem to have their guards down so thoroughly, do they ever acknowledge the workings of the body so directly, but even here, their language is so ornate, their refinement so complete, that they manage to make these bawdy tales of diarrhea and peeing vigorously in buckets sound like delightful chatter over tea. Language is very important to this film, which boasts a marvelously clever script by Greenaway in which every word, every circumspect and torturously polite turn of phrase, disguises some secondary meaning, often a naughty bit of sexual double entendre — lots of appreciative banter about fruit, ripeness, fecundity, and "the maturing delights of her country garden" — or a sly insinuation about someone or other's reputation, or a threat so carefully hidden in banal chit-chat and freighted symbols that its more sinister meaning might utterly pass over the head of the one being threatened. There's a very complex game being played here, hidden away beneath all the ostentatious politeness. The artist Mr. Neville (Anthony Higgins) is invited by Mrs. Herbert (Janet Suzman) to undertake twelve drawings of her husband's lovely country estate, which, she implies, her husband prizes as his property even over his own wife. After much persuasion, the two sign a contract that, in typically circumspect language, promises both sexual and economic remuneration for Mr. Neville's artistic services, and the arrogant young artist installs himself at the Herberts' estate, in Mr. Herbert's absence, for a period of twelve days to complete the drawings, earn his pay, and help himself to the sexual favors of the lady of the house. Though Neville believes himself to be the one in control, the one benefiting the most from this arrangement, the reality proves to be quite different from the appearance. There is definitely an uneven balance of power here, but contrary to Neville's confidence in his own prowess, both artistic and sexual, he is not the one with the power. He is lower-class, despite his finery and his polite manners, and none of the aristocrats ever truly accept him into their class even as they welcome him into their homes. And it turns out that they are playing a game at a far higher level than he had imagined, a game that increasingly entangles him helplessly because, not being of their class, he is utterly unequipped to engage in these games involving property and parentage. Very suggestive in this regard is the scene where Mrs. Herbert's daughter, Mrs. Talmann (Anne-Louise Lambert) explains to Neville the identity of a young boy who wanders the grounds under the care of a tutor. He's an orphan, she says, whose father died and mother converted to Catholicism, so he needed to be cared for by relatives here. "An orphan, madame," Neville sputters, "because his mother became a Catholic?" Indeed, and Neville, with his Scottish sympathies and incomprehension of the aristocrats' religious bigotry, simply proves again and again that he does not belong here, that he is not truly a part of this milieu. No, he is simply a tool to be used, and his drawings increasingly begin to seem like they are meant to play an important part in an elaborate plot being concocted, possibly by everyone except Neville, behind the scenes. There is considerable debate within the film, amongst the aristocrats who are privy to the drawings' contents, about precisely what kind of an "allegory" Mr. Neville is attempting to convey with these seemingly symbol-laden depictions, and one suspects that Greenaway is trying to excite the same debate regarding the film as a whole. Neville, for his part, continually insists that he simply draws what he sees, that he's merely an objective documentarian of reality, but Greenaway is undermining that artistic innocence, that naïve understanding of how art works. No drawing, no piece of art, can (or maybe should) passively document the world as it is, no matter how mechanical and purely visual Neville tries to make his art with his rigidly selected views, his viewing grid that breaks each scene into carefully composed rectangles, his totalitarian insistence that his views be uninterrupted, everything laid out exactly as he demands. Like Mr. Herbert, who'd shaped his land into a structured, carefully manicured and maintained geometric layout in order to tame nature itself, Neville believes that he can control the world, that he can dictate what he sees and doesn't see, and thus what will appear or not appear in his drawings. But circumstances and the subtle interventions of various unknown conspirators shatter this illusion: his work is not merely innocent documentation, and his static, controlled views are increasingly disrupted by changes mysteriously wrought from one sitting to one another, clues planted, bits of evidence suggesting various covert conspiracies and activities, details pointing to murder or adultery. In other words, the carefully laid out gardens, so meticulously planned by Mr. Herbert and so thoroughly documented by Mr. Neville, are disordered and littered with evidence that the placid surface of things in only a thin, all too easily broken barrier separating polite society from all the messiness, dishonesty and ugliness of life, which keeps impolitely depositing obstructions into Neville's view, forcing him to make concessions to change and impermanence and imperfection rather than being able to craft, uninterrupted, a static, lifeless, unpopulated vision of the estate's grounds, blissfully undisturbed by any actual evidence of life or humanity. The film is formally laid out in such a way as to both superficially confirm Neville's seeming mastery and subtly undermine it. Greenaway sticks almost entirely to static, carefully composed shots, often shot at least in part through the viewing grid that Neville uses to impose geometric order on what he sees so he can render it in his drawings. And yet Greenaway undercuts this rigidity at every turn, constantly having Neville's view obscured or interrupted by intrusive figures walking across his field of view, marring the unmoving beauty of the landscape. 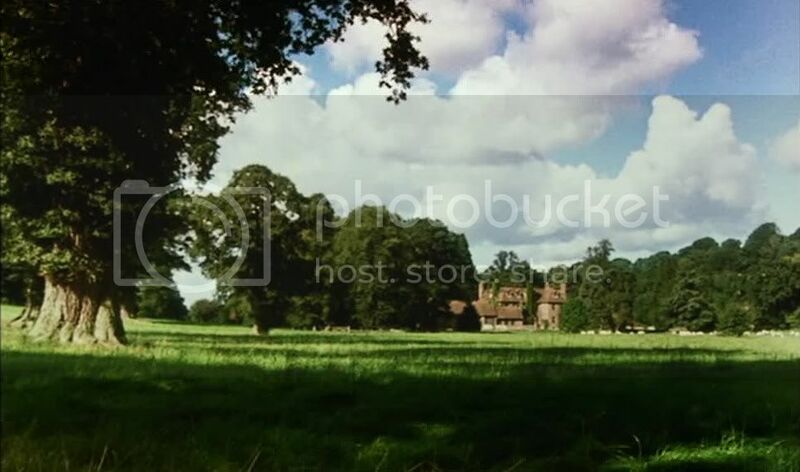 At one point, the director holds a shot of an unpopulated landscape long enough for the sun to be hidden by clouds and then break free, so that a long dark shadow passes across the green grass and then vanishes again, even the sky itself introducing movement and change into what Neville would like to freeze and order. When a thick gray fog rolls across the estate, Neville is unable to work, pacing impatiently back and forth while he waits for his view to clear again; if sinister aristocratic conspiracies don't undercut his dominion, then the elements conspire to remind him of his helplessness. Michael Nyman's enthralling score, appropriately enough, embodies the same dichotomy, combining courtly elegance with a propulsive, lively quality that suggests all the skullduggery and mystery lurking within the film's surface depiction of aristocratic refinement. Greenaway's love of lists, as seen in his early avant-garde shorts and his exhaustive, exhausting first feature The Falls, persists here in the narration that meticulously describes the conditions for each of the twelve drawings. So perhaps, to some extent, Greenaway is poking fun at his own pretensions to artistic control, his own fussy obsessive-compulsiveness about naming things, about grouping objects and people, sights and sounds, into categories and descriptions, creating order through art. Key to the film is the question of the artist's responsibility to do more — as Greenaway, certainly, always has — than simply document and observe. Being the British Hollis Frampton, Greenaway has invariably annoyed me. And this is one of his early funny ones. I haven't seen any late Greenaway yet, but man do I love early Greenaway. The shorts, The Falls, this film, all amazing, funny, thought-provoking stuff. A brilliantly intricate all-encompassing analytical essay that stands among your very best. But I know Greenaway is one of your favorites, as he is one of mine as well. THE DRAUGHTSMAN'S CONTRACT is a maddening elliptical mystery, one where plot is used for the purpose of the director's compositions, and the film is a fascinating hybrid of social commentary and the aforementioned avante garde, filmed as I recall in 16mm. My favorite Greenaway of them all happens to be the one that achieved the most popular success - THE COOK, THE THIEF HIS WIFE AND HER LOVER, as that film showed the director at his most entertaining and didn't compromise on the physical beauty and had a buffo Michael Nyman score to boot. But I love a number of others, especially PROSPERO'S BOOKS, THE PILLOW BOOK and NIGHTWATCHING. Your discussion of the use of language in the film is fascinating. And yes, Greenaway is a list obsessive, bless his heart. Ha! THE BABY OF MACON has been out on a very nice Region 2 DVD for several years now, (with a blu-ray now available as well) but I am assuming you are referring to Region 1 release, in which case your link is absolutely the way to see it. The DVD does look great, but God what a bizarre film. But I do like it still. David Hockney sat next to me at the press screening of Porspero's Books here in L.A. After ten minutes he siged deeply and walked out. I sat through the thing. Should have followed his lead. The Belly of An Archtect is tolerable tahnks to a bravura lead performance by Brian Dennehy, and good supporting ones from Chloe Webb and Lambert Wilson. LOL!!!!!!! The friend I saw PROSPERO'S BOOKS still to this day chides me for 'bringing him to the worst films he's ever seen" but I have stuck to my guns. As with much of Greenaway he virtually defines the term "an acquired taste." Ha! But I can watch THE COOK, THE THIEF any day at any time. Some of the lines there have become pure camp as well. Good account. Greenaway is a candidate for the most interesting British director of the last 40 years, one of the few working in the high formalist European arthouse style, and hence destined to be more appreciated abroad (note that he went on to work with the same cinematographer as Resnais and Ruiz). Also impressive is the fact that he did the Draughtsman drawings himself. Too bad that much of his latter-day work (notably the gloriously overreaching, if uneven, Tulse Luper Suitcases project) has suffered from minimal distribution and critical blackballing, although the most recent, Nightwatching, struck me as a pale retread of Draughtsman's. Certainly, you have many highlights still to look out for - I gather the BFI will be releasing The Belly of an Architect on DVD/Blu soon. Thanks, Sam. I've woefully lagged in exploring later Greenaway considering my love of everything I've seen by him, but I look forward to catching up with the rest. Ken, good contextualization of Greenaway in the European high art tradition. I love his drawings too. His art in this film and especially in A Walk Through H is great, showing that he's really multi-talented. If you want a hint as to what the film contains, the 'list' in the film is the books of Prospero's library which contain not only everything in the natural world but everything beyond the natural world. It's the ultimate Greenaway film, and unparalleled in most every way. And The Cook, the Thief... has the clearest plot, if that's what you're interested in Greenaway for. Most of all, Greenaway is a comedian, and I have never found a comedian who can create so much hilarity without jokes (which is not to say that he doesn't use jokes). The greatest. Of the first two films mentioned, one is an amazingly clever rumination on the implications of death (not the emotional reaction to it, as 99.9% of other films approach the subject), and the other is a thoroughly unpleasant treatise on unpleasantness which is so transparent that its innumerable layers become the most detailed investigation of provocation, point of view, exploitation, etc. that I have ever encountered. Again, the greatest. While I acknowledge that THE COOK THE THIEF HIS WIFE AND HER LOVER offers up Greenaway's most linear plot structure, that is hardly the only reason why it's my favorite, if indeed that is a reason at all. The film's underlying perversity and errie opulence (the kitchen sequence with the young albino boy singing that ravishing hymn is captivating for one) the ravishing set pieces and decor, the electrifying performance by Michael Gambon, a great Michael Nyman score, and some camp dialogue that stands with the best in that category. But as I stated here on this thread I appreciate so much of his work, including the far different and abstract PROSPERO'S BOOKS and THE PILLOW BOOK, the excellent documentary on Rembrandt's NIGHT WATCH and the early shorts. Yes, THE BABY OF MACON is indeed on an all-Region disc now, but the original release, which I've owned since it first came out was Region 2 only. LEAVES, those descriptions of those films just make me more eager than ever to get to later Greenaway. I have seen A Zed and Two Noughts, but ages ago, so that I remember liking it but not much else. As Sam says, hard to imagine that the plot is EVER a reason, let alone the reason, to see a Greenaway film. It's telling that he started out as a totally non-narrative filmmaker, and even when there are stories of a sort (like in A Walk Through H, which tells a story, however abstract it is), the story isn't really the point. I love The Cook, the Thief, etc. as much as the next guy, but for someone who is already well versed in cinema and in early Greenaway I think it's one of the least intriguing to watch simply because it's one of the least singular. In case of a water landing, grab The Cook, the Thief..., but reach for the skies, first! That's my feeling on the matter, anyway. Greenaway has some pithy line about how we have yet to see films, just animated text. Not a big fan of plots, him. He does use a lot of wordplay, though, which is something else entirely. Just say no to Greenaway on Youtube! Greenaway gets too distracted by own perversions and often winds up making unwatchable films (art pornos, really), but 'The Falls' and 'The Pillow Book', at least, are genius. There's a reason he and Nyman no longer work together. 'Nightwatching' was very well done, if not on that same high level.